Five years ago, a 9.0 magnitude earthquake hit Japan’s Fukushima Prefecture, triggering a tsunami and leading to a nuclear disaster. Towns and beaches in close proximity to the plant were affected as toxic water made its way through drainage ditches and into the soil. Though there have been extensive clean-up efforts, some beaches still have signs of radiation in their sand and waters. Despite this, surfers have continued to come to these beaches to brace the waves, with some even returning on a daily basis. “Of course we may seem a little crazy, but for us, the important thing is the waves,” surfer Yuichiro Koboyashi said in an interview with the Japan Times. When journalist Kimball Taylor traveled to the city of Sendai near the nuclear plant to speak to surfers in the area, he found that an estimated 50 percent returned a year or two after the disaster to start surfing again. Many of the surfers told Taylor they simply don’t think about the potential radioactive dangers lurking in the waves. “We will only know the true consequences of our time in the water 20 years from now,” a surfer told Al Jazeera. Many of the beaches have been classified as safe by the government, but there are still concerns about radiation levels. And even though the surfing community has still come to this region, the majority of the surfers are older. Children are more often kept away. 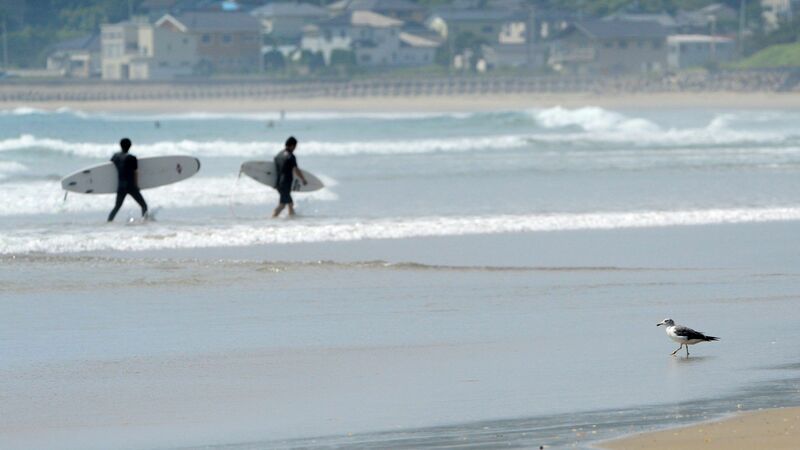 “I worry about the youngsters because if they are exposed to radiation now, it might affect them when they grow up,” surfer Toshihisa Mishina told the Japan Times. Though Mishina returned to Toyoma beach, he said he would never allow his 12-year-old to join him. According to Taylor, those who did stop surfing after the disaster did so to honor the thousands who were killed by the tsunami that hit the beaches, with remnants like socks, family photos, and children’s toys still visible on the shores. “The government keeps telling us that things are back to normal in the region, but we can see that few people have come back,” one surfer told Al Jazeera.